When you shop with a list, it's easier to find what you need and want, as well as stick to your budget. Before you shop for gifts, set a budget for what you can afford to spend and then keep a running total of what you've bought, how much you've spent and where you stand in relation to your annual gift giving budget. 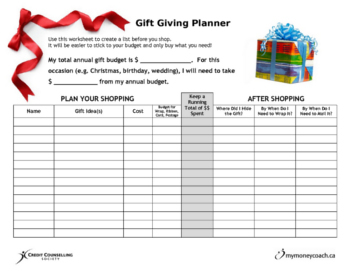 Here is a simple to use one-page gift giving planner. Print a few copies and use one page for the birthday gifts you buy each year for family and friends and a few pages for all of your holiday season and Christmas gifts. By listing out who you want to buy for, ideas for what you want to buy, how much you've spent and what you've done with the gift after you've bought it, you'll keep yourself on track with your shopping and avoid buying more than you actually need. Most Canadians end up with at least some post-holiday debt. Using a gift giving planner is one thing you can do to help yourself avoid credit card debt. Here are more ideas to help you plan your holiday spending, saving and debt repayment. Is Shopping in the US Worth It?